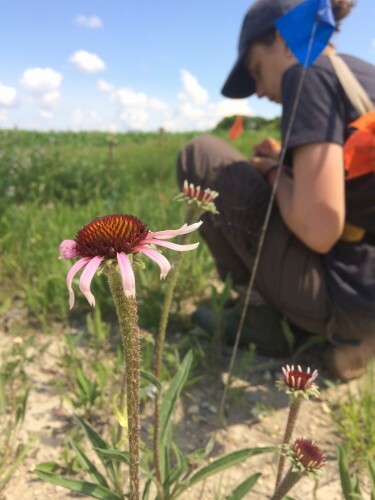 Team Echinacea has studied the timing, or phenology, of flowering in remnant populations of Echinacea in 10 seasons since 1996. (Honestly, Stuart did it only inadvertently those first three seasons.) We use phenology to assess the temporal mating potential of individuals in remnant populations—the mating opportunities available to individuals based on when they are reproductively active. If an individual flowers synchronously with its neighbors, its chances of receiving and exchanging compatible pollen will be greater than if the individual is asynchronous. To monitor phenology, we identify flowering plants early in the season, before they begin shedding pollen. Following that, we visit plants at least once every three days and assess flowering status until the plant is done flowering. Doing so, we obtain start and end dates of flowering for each flowering head in the remnants. Additionally we keep track of any occurrences that lead to premature end of flowering or reduced seed set such as disease, stem damage, herbivory, or head deformities. Kelly Kapsar presented this poster at the Midwest Ecology and Evolution Conference summarizing her study of flowering phenology and temporal isolation in six remnant Echinacea populations. Sarah Baker gave a presentation at National Conference of Undergraduate Reasearch about her, Kelly Kapsar, and Amber Zahler’s work studying phenology in the remnants from 2011-2013. The slides from her presentation can be found here.